Hollywood Gothique's 2009 Halloween Haunt Odyssey began with a trek westward, first to the Forest of Mirrors in Woodland Hills and then to the Reign of Terror in Thousand Oaks. After savoring the sinister spooks at both attractions - in as leisurely a manner possible while knowing that darkness and distance in abundance separated us from our next intended destination - we retraced our steps eastward, then turned south on the 405 Freeway, heading toward Santa Monica. 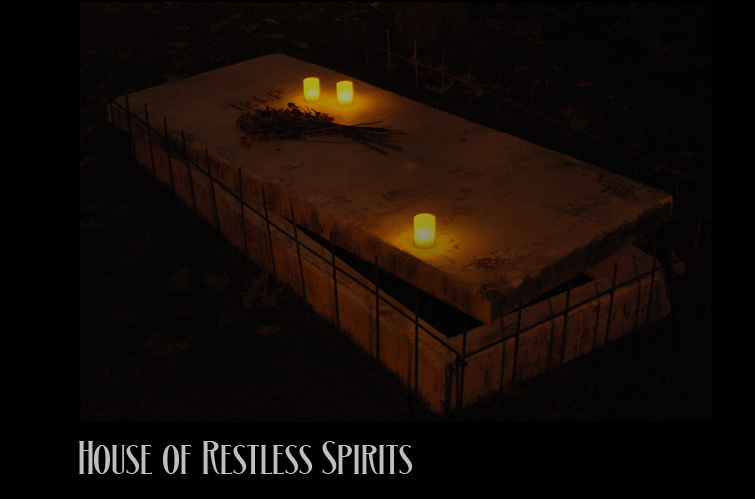 Our target, of course, was the House of Restless Spirits, the somber dwelling haunted by the relatives of Captain Nathaniel Jacks, felled decades ago by an influenze epidemic. The 2009 incarnation of the haunt was much the same as in previous years: ghostly, glowing footprints in the front yard; a gate rattled by an unseen hand; a child who disappears from a painting and manifests in ectoplasmic form; shadows of unseen figures moving on the back porch; tombstones tilting in the back yard; the ghostly captain crafting coffins for his dead family in the garage out back; a ghostly harpist visible through the window; an angry black cat as you come around from the back toward the front of the house again; a small statue reciting macabre lines from Emily Dickinson, while candlesticks float in the background and a spider rapidly ascends and descends its thread. The only new touch we noted was a ghostly gravedigger in the backyard. When you pause to peer down at a coffin, whose lid is moved by skeletal hands from within, a lantern hanging in a nearby tree casts a dim glow on a wall; intermittently, the glow reveals the shadow of the gravedigger, hard at work, apparently through eternity. Our guide into the unknown for the eventing indicated that other manifestations were expected this year, yet somehow they failed to materialize. (Who can predict the the ways of spirits from the beyond and when they will choose to appear to us?) No doubt these ghosts will find their way to the house in time for Halloween next year. Even if they do not arrive in 2010, House of Restless Spirits remains the most remarkable home haunt in the Los Angeles area. There is a vast variety among these attractions - some whimsical, some funny, some creepy, some terrifying - but this is the only yard haunt that feels genuinely haunted. Only a few short miles away in Venice is another entertaining yard haunt, the Eternal Rest Cemetery. Venice has a vibe all its own; with its mixed-used zoning, residences practically side-by-side with businesses, it is not immediately clear that the sinister house is a mere yard haunt and not some eccentric roadside attraction. In any case, it is ultra-cool to pull up to some local coffee house where late-night wanderers are imbibing their espresso, and then walk across the street to what looks like a haunted house, with flashing lights and billowing fog. The high fence outside partially obscures the yard, which is accessible throught a large gate. Two motionless ghouls await outside: one is a mere mannequin, but watch out - the other turns out to be all too real, springing to life unexpectedly as you draw near. Inside the gate, the front yard is decorated like a cemetery. After a short wait, you are allowed to take a tour through a short but reasonably intense walk-through maze on the side of the house. The space is very limited, but the Eternal Rest Cemetery have put it to good use, constructing narrow corridors that leave no leeway for avoiding the horror that lies therein. The strategy is simple but effective: in order to progress, you have to approach various static figures until you are face-to-face with them - and then with a sudden snarl or grasping movement they deliver the scare. 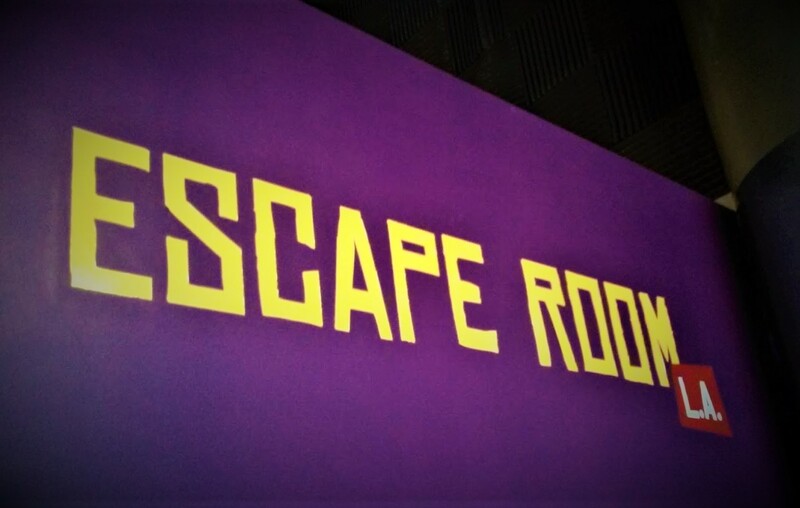 The repetition actually works, because even after you realize that the figures are actors, not mannequins, the confines of the maze prevent you from using your knowledge to steer clear of them. The Eternal Rest Cemetery also offers an extra scare or two after you emerge from the maze into the yard again: just when you breathe a sigh of relief, thinking the horror has ended, a reclining figure among the tightly packed lawn decorations lurches to its feet, delivering an unexpected shock. 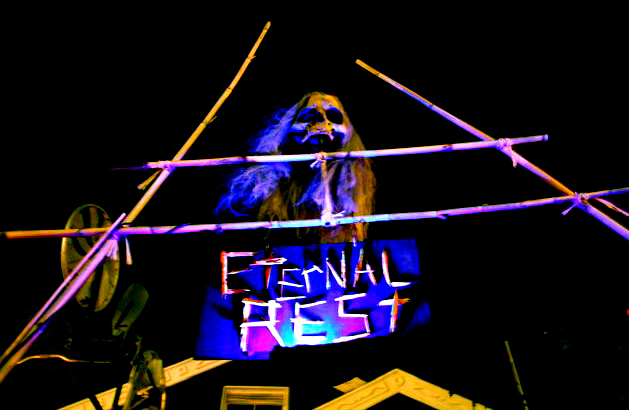 Eternal Rest Cemetery does not offer the sophistication of the House of Restless Spirits. Its decor is store-bought rather than home-made, and it goes for shocks rather than subtle scares. Fortunately, this approach provides a perfect contrast with its neighbor in Santa Monica, and we cannot think of a better one-two punch available in Los Angeles. Halloween fans who live near the beach would be well advised to check both of them out next year, preferably in the same order we did. House of Restless Spirits will lull you into a dreamy spooky limbo-land, where spirits wander with eerie effectiveness but without malicious intent. Eternal Rest Cemetery will then shatter your trance-like connection with the ethereal plane, as angry ghouls attack without warning or remorse. Each works in its own way, and experiencing them back to back is a Halloween treat that's hard to beat. Unfortunately, our long journey from Woodland Hills to Thousand Oaks to Santa Monica to Venice had used up the evening, and by the time we escaped the ghostly dangers of the Eternal Rest Cemetery, the Witching Hour was drawing near. Yard Haunts, as a rule, close early, and there were none to left open within easy driving distance. The end of Halloween is always sad, as spirits crawl back to their moldering graves for another year, eagerly awaiting their next chance to appear; it was especially so on this night, when we had experienced relatively few haunts, four in all. Fortunately, we were able to extend the season by a day, visiting two more haunts that took advantage of the weekend by staying open on Sunday, the day after Halloween. Stay tuned to hear what horrors we encountered therein. Coming up next: the Burbank Underground, an established yard haunt operated by Rotten Apple 907, followed by the Vampyre Inn's Bloody Ball, a new professional haunt in West Hollywood.